Unlike diet and exercise, it's not hard to do. Unlike most natural remedies, it works better and faster. So What Is This Superstar Nutrient? It's called tocotrienol (toe-co-try-en-all) and it's a cousin of vitamin E.
You probably know that vitamin E is good for your heart and arteries. But tocotrienols go much further than regular vitamin E.
Why? Because they have a slightly different structure. The nucleus of vitamin E and tocotrienols are both the same. But the difference is the side chain or "tail" of the molecule. You see, the tails of tocotrienols are 30% shorter. That's what gives them special healing properties. A longer tail would firmly anchor into your cell membranes, while a shorter tail doesn't anchor as deeply. This makes the tocotrienol molecule more mobile. As a result, this molecule moves easily from one cell to the next. And that means it moves throughout your body to protect your heart and arteries. Bottom line: tocotrienols deliver SIX kinds of critical protection for your heart and arteries. It's the kind of protection you won't find in any other cholesterol therapy. But don't take my word for it. Let me prove to you why tocotrienols can help you manage your cholesterol numbers. As a savvy reader of health information, you may know that the cholesterol in your diet plays only a small role in your cholesterol levels. After all, the liver produces 80% of your body's cholesterol — about 1,000 milligrams a day. The other 20% comes from the foods you eat. So, yes, cholesterol in your diet has little impact. Now, your liver uses an enzyme called HMG co-reductase to manufacture cholesterol in your body. In fact, it is this very enzyme that conventional therapies target to lower your cholesterol. Well, what makes tocotrienols so remarkable is that they inhibit this enzyme without blocking your body's production of CoQ10. That's because of its special "tail." The tail you learned about earlier. Tocotrienols inhibit the HMG enzyme differently than conventional therapies, so CoQ10 production is not compromised. 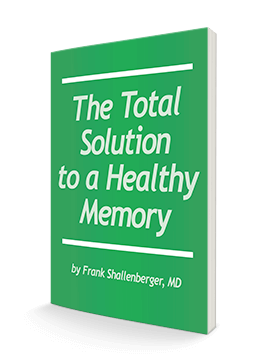 Indeed, as I mentioned earlier, a recent study found that tocotrienol actually raised participants' CoQ10 levels an average of 20% because of this special "tail." That's the equivalent to you taking 10-20 mg daily of CoQ10 as a supplement. As far as I know, tocotrienols are the only heart-healthy nutrient in the world that can potentially boost CoQ10 within your body. As I mentioned, tocotrienols work by reducing the enzyme HMG co-reductase, which is the source of 80% of all cholesterol in your body. As a result, they can lower your total cholesterol more quickly than any natural remedy. The good news gets better. Much better. LDL is considered the "bad" cholesterol because if you have too much LDL in your bloodstream, it can stick to the walls of your arteries. This buildup of plaque causes hardening of the arteries, where the artery walls become narrow, making it harder for blood to circulate. And that's why the more LDL you have, the more cholesterol is in circulation, and the greater your risk of a serious coronary "event." An event brought on by artery-clogging plaque that often has NO symptoms. Now, it's estimated that a 1% drop in LDL levels reduces your overall risk of a heart "event" by 2%. Aware of this relationship, most conventional doctors prescribe conventional treatments for patients with high cholesterol. But I am opposed to therapies that have the potential to harm, when there are safe, natural, effective alternatives available. And one such remarkable alternative is tocotrienols. In several studies, patients taking tocotrienols saw an improvement in their LDL levels in as little as two weeks. And, most saw a 15-20% reduction in their LDL levels in only 30-days. That's significant. HDL, the so called "good" cholesterol, has the most important job. It removes excess LDL from your blood and scrubs plaque deposits off your artery walls. What's more, HDL carries this excess cholesterol back to the liver, so your body can eliminate it. This guy is a true lifesaver because its job is to sweep out your arteries like a roto-rooter, which is why you can never have too many. Fact is, the higher your HDL levels-the more protection you have against serious heart problems. But here's the problem: Unless you exercise regularly, it is very difficult to raise your HDL levels. 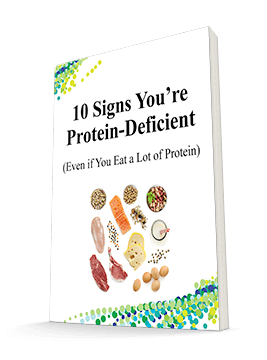 Fortunately, tocotrienols can boost your HDL levels. Here's the proof: Participants in several studies used 100 mg of this natural wonder to boost their "good" HDL cholesterol numbers by 4-8%. This is a significant increase. It is significant because for every 1% increase in HDL, your risk of a heart "event" drops 3-4%. So if tocotrienols raise your HDL cholesterol numbers by 5 percent, your risk of a major heart event drops by 15-20%. That's huge. But when it comes to the benefits of this heart-helping nutrient, the best is still yet to come. Triglycerides are another type of blood fat that is dangerous. In high amounts, triglycerides make the blood more sluggish and less capable of transporting oxygen, particularly through the smallest blood vessels. More importantly, they are often linked to low HDL levels. So, the more triglycerides you have, the more fat there is in your system to plug up your blood vessels. Not surprisingly, people with normal cholesterol levels can still have a major heart "event" if their triglycerides are too high. Furthermore, triglycerides are also a huge marker for something else. Insulin resistance. If you have high triglyceride levels (over 150 milligrams/deciliter,) you are at serious risk for insulin resistance. You'll be happy to know that tocotrienols process dangerous fatty triglycerides more efficiently than other cholesterol-lowering supplements. Even better, participants in various studies were able to reduce blood triglycerides by a whopping 20-25 percent! That strongly suggests tocotrienols can improve your insulin resistance. * Daily Value not established. 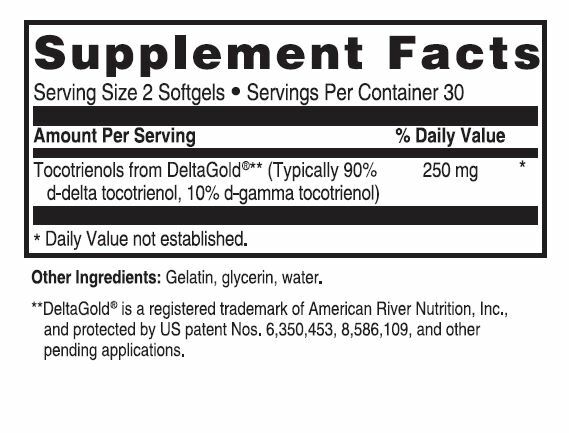 **DeltaGold is a registered trademark of American River Nutrition, Inc.
As if all the benefits I've told you so far are not enough, tocotrienols deliver another unexpected benefit to protect your heart and arteries. As you may know, c-reactive protein is a possible contributor to inflammation in blood vessel walls. Inflammation increases the rate at which artery-clogging plaque develops. The studies I've mentioned throughout this letter also followed c-reactive protein levels. They found that tocotrienols decreased 20-50%. For regular vitamin E to do the same, you would need approximately 800-1,200 IU per day. So tocotrienols were many times more effective at reducing CRP than vitamin E. Astonishing, isn't it? Astonishing that one powerhouse nutrient can help you conquer all six major threats to your heart. And you can do it -- without strenuous exercise, changes in diet or dangerous conventional therapies. And many other scientific studies support this conclusion too. Because I'm so impressed with the great results of tocotrienols, I've asked the folks at Advanced Bionutritionals to carry Delta Tocotrienols. You can take advantage of our 6-month supply for the biggest savings and the lowest price per bottle. A 6-month supply is only $33.25 per bottle, which works out to $1.10 per day! A generous savings of $40.20. Plus, you'll also save on shipping, a $6.95 value when you buy a 6-month supply. Now, I suggest you go with the 6-month option because it saves you the time and trouble of reordering, and you'll avoid the possibility of running out. If for any reason, you're not completely thrilled with the results you get with Delta Tocotrienols, just send the empty bottle back within 90 days of your purchase. And, every penny you've paid (including shipping and handling charges) will be promptly and cheerfully refunded. You only pay return shipping. No hassles. No hard feelings. No questions asked. You have my solemn vow on that! By the way, I'm offering this guarantee for two reasons. First, I want to demonstrate my clear confidence in this powerful product. Second, I want the buying experience with you to be a positive and pleasant one, so you'll want to do business with us again and again. What I'm saying here is don't decide now if Delta Tocotrienols is right for you. Try it out — RISK FREE. I think that's fair, don't you? …for a healthy heart and circulatory system. Imagine. You can finally get ALL these health benefits from one heart-helping nutrient. ALL at the same time. And ALL without blocking your CoQ10! If you've come this far, I think you'll agree I've given you several good reasons to give this proven product a chance to work for you. So do yourself a big favor. Take advantage of this special introductory offer right now while it's fresh on your mind. And soon you'll experience the significant health benefits for yourself. Click here now to save up to $40.20 and start improving your heart health today. ACT NOW! 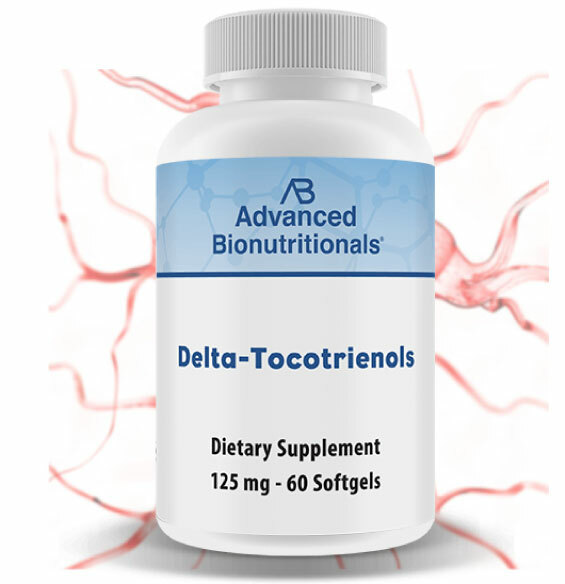 Order Your Delta Tocotrienols Today!